Jamaican-born New York legislators Assemblyman Nick Perry and Senator Leroy Comrie presented citations to Jamaica’s Reggae Girl Nicole McClure, who was a special guest of the Queens-based Team Jamaica Bickle (TJB), at its 25th anniversary launch, at the Jamaica Consulate in midtown Manhattan on Jan. 8. TJB is marking 25 years of operations at the Penn Relays, at the University of Pennsylvania, in Philadelphia. 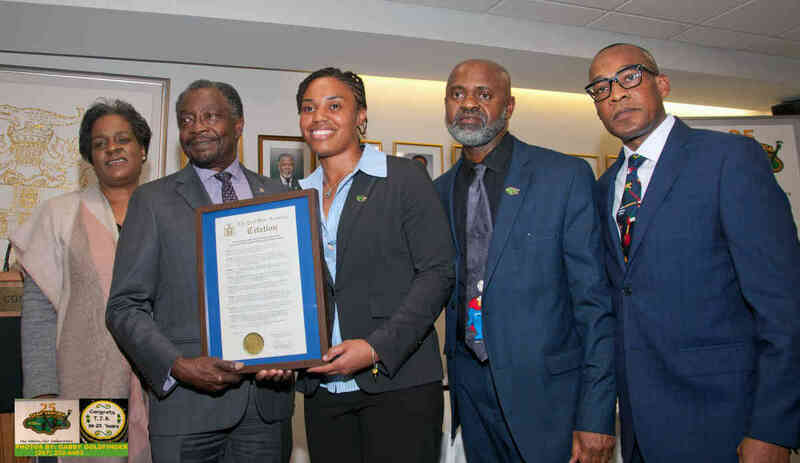 TJB said Perry and Comrie presented the special award to McClure, goalkeeper of the Reggae Girls soccer team, during the ceremony at the Jamaica Consulate in midtown Manhattan. Perry represents the 58th Assembly District in Brooklyn, which encompasses parts of East Flatbush and Canarsie. Comrie, represents the 14th Senatorial District in Queens, including portions of Jamaica, Cambria Heights, Queens Village, Hollis, St. Albans, Laurelton, Jamaica Estates, Briarwood, Hillcrest and Kew Gardens. The Reggae Girls team created history when it qualified for the 2019 FIFA Women’s World Cup to be held in France from June 7 to July 7. 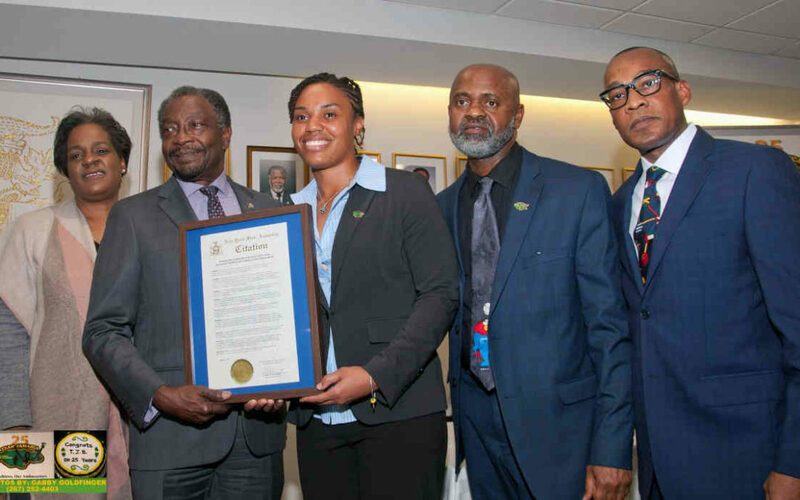 After receiving the citations, McClure said she was “thankful for the recognition” bestowed on her, according to TJB, which provides meals and transportation, among other things, to Jamaican and Caribbean athletes annually at the Penn Relays Carnival. She also spoke of “the place of honor and the pride” she feels in serving her country, TJB said. “She expressed gratitude to her family, and to her soccer club and coaches for all they have contributed to her development and to Team Jamaica Bickle and both Assemblyman Perry and Sen. Comrie for the citations,” TJB said. McClure said that “being recognized by Team Jamaica Bickle is an honor. “They are a prestigious organization that caters to athletes representing the Caribbean at the Penn Relays,” she said. “To be amongst such an elite group means a lot to me – more than I can describe. “Born in the USA to hard working and committed Jamaican parents, Nicole embodies and personifies our children’s respect and willingness to associate with their roots – a true ambassador of our cultural heritage and ‘Jamaicanism,’” Clare said. TJB said it provides “premier hospitality services” for athletes from Jamaica and across the Caribbean at the Relays Carnival. It said athletes are “treated to three hot meals daily, ground transportation, chiropractic and medical services, as well as mentorship. TJB, which was formed in 1994, five years later became the first Jamaican organization to be a participating sponsor at the Penn Relays.